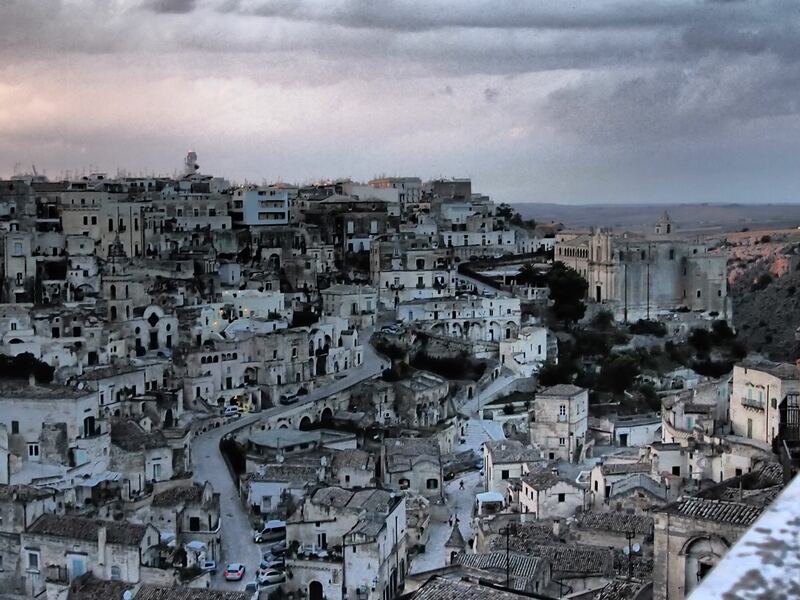 Matter is famous for it’s ancient town , the “Sassi di Matera” (meaning “stones of Matera”). The Sassi originate from a prehistoric settlement, and are suspected to be some of the first human settlements in Italy. The Sassi are houses dug into the rock itself, Many of these “houses” are really only caverns, and the streets in some parts of the Sassi often are located on the rooftops of other houses. The ancient town grew in height on one slope of the ravine created by a river that is now a small stream. The ravine is known locally as “la Gravina”. 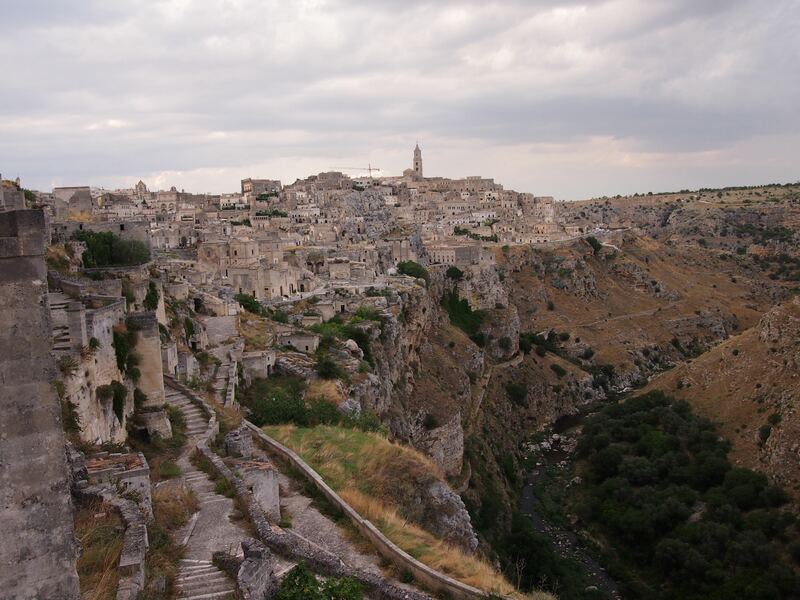 In the 1950s, Matera was considered the shame of Italy as the infant mortality rate was 50%, the worst in the country. Homes did not have electricity, water or any form of sanitation. The Italian government forced locals to leave their cave like dwellings and relocated them to what is now the modern par of the city. 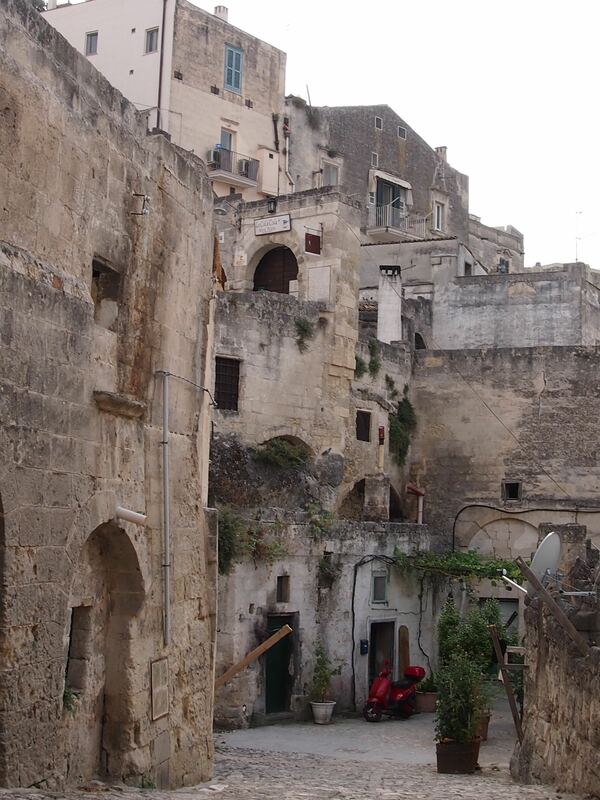 Until the late 1980s the Sassi was considered an area of poverty, with most houses still unlivable. The 90’s bought a new feeling of pride of heritage and some families with government aid were able to renovate their old homes and bring them up to date with modern times. 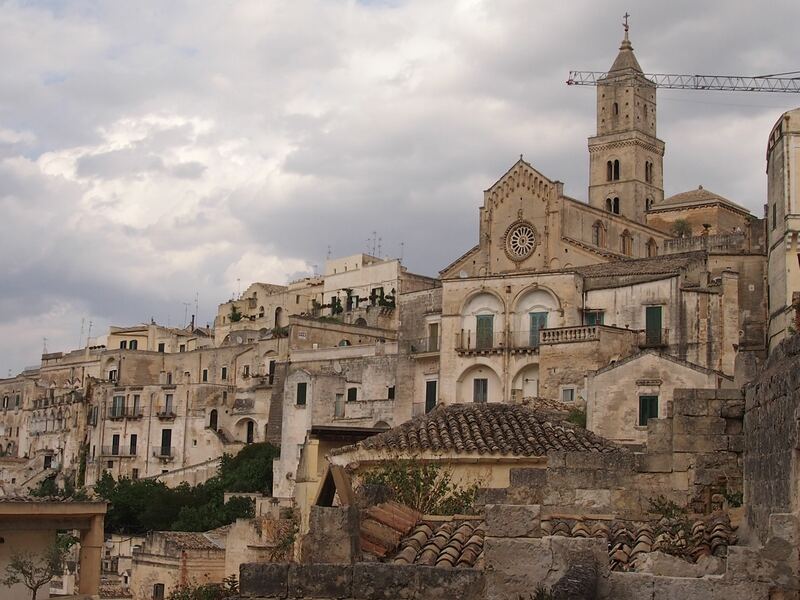 With government grants the current local administration, became more tourism-oriented, and has promoted the re-generation of the Sassi with the aid of the Italian government and UNESCO. We based ourselves in the heart of Sassi staying at Locanda Di San Martino. We hired a local guide Antonio who guided us through this well preserved town. The children were kept constantly engaged as we learnt about the original inhabitants from pre historic times to the Benedict Monks who built the cave churches, through to the poverty stricken streets with raw sewerage and illnesses such as cholera and malaria running rife through the town. Antonio gave us a real insight into this interesting town and the 4 hour walking tour gave us a great insight into the history of this unique town. 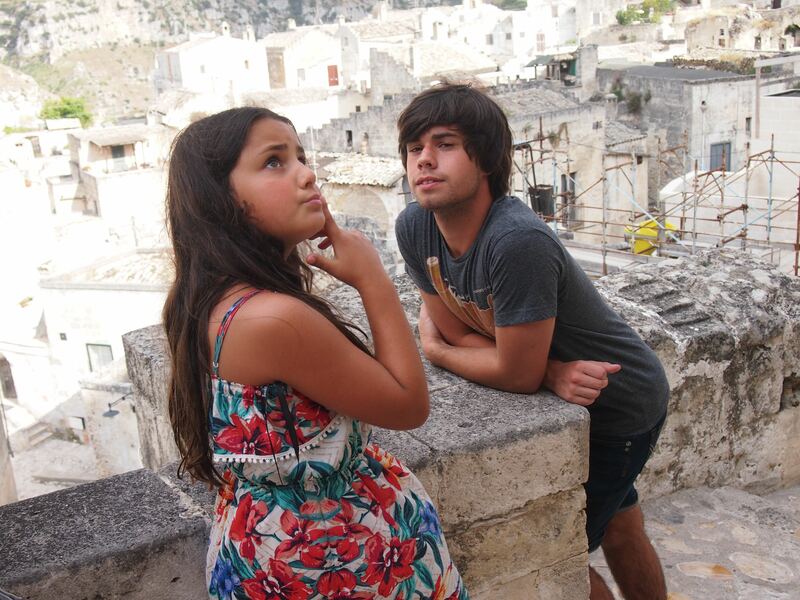 Allanah and Thomas deep in thought..
We dedicated 2 nights to Matera on our 100 day trip around Europe. Our plan was a day of touring and a day of respite relaxing in the hotel’s thermal pool. Unfortunately the hotel had failed to advise that children under 16 years of age were not permitted to enter their pool area (one of the main reasons I had chosen the hotel). 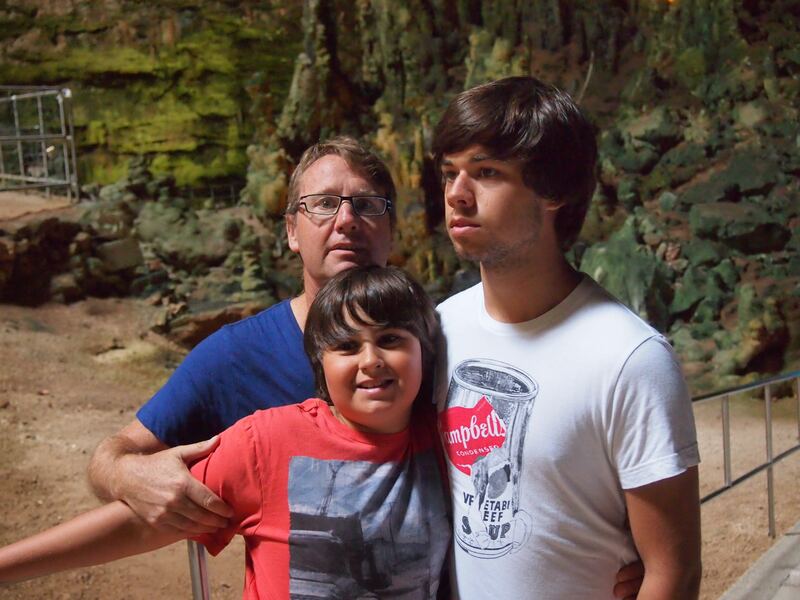 Spending one more day in a cave room gave us all a bit of claustrophobia, but we had no choice as we had pre paid our room and wouldn’t refund. One full day here is really enough to see all the sights. We filled our extra day repacking and sorting our suitcases , strolling through the winding streets , and consuming an immense amount of gelato (we found the best gelati shop in all of Italy here). 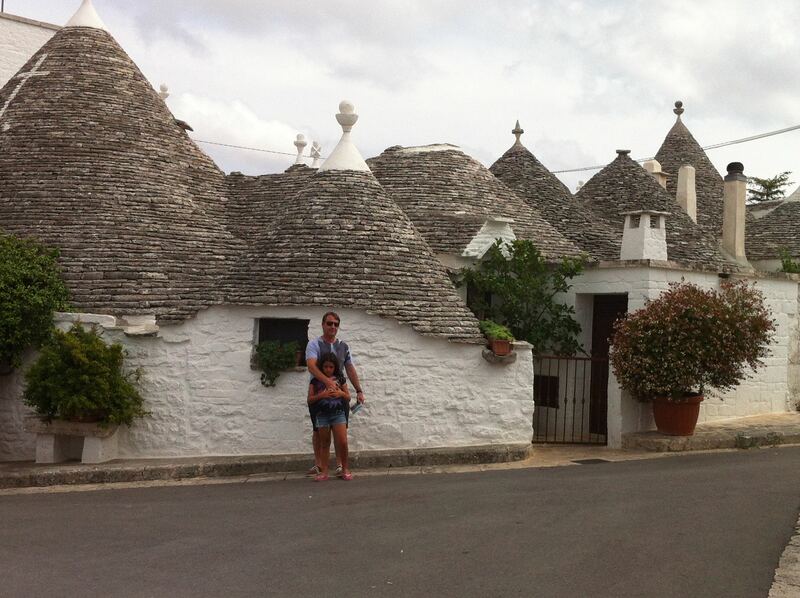 We were ready to move on and be on our way to our next destination of Ostuni via Alberobello. 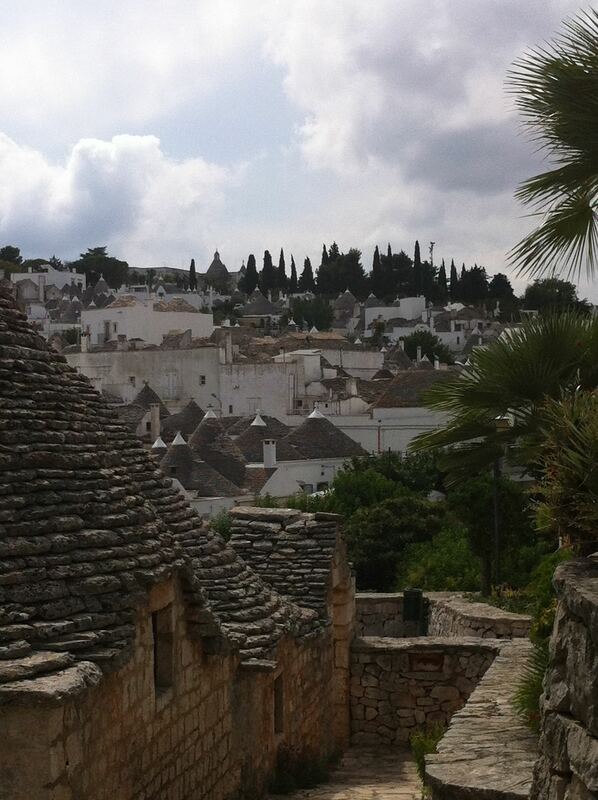 Alberobello is in the South Eastern Puglia region. 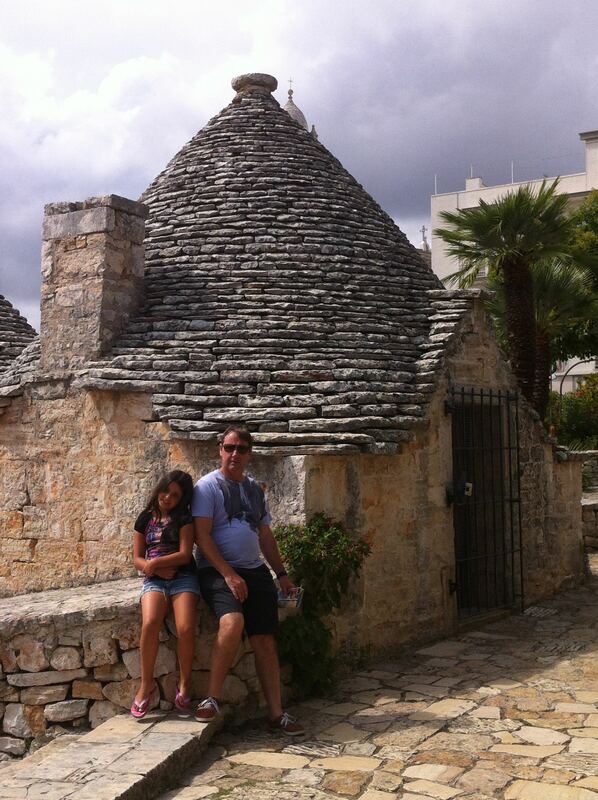 A white washed town distinguishable because of it’s “trulli” homes, conical shaped dry stone huts. This town has been on the tourist route for quite a few years now and it has taken away from some of it’s charm. The souvenir shops are abundant and we found it difficult to find a genuine non touristy restaurant. We managed to have a find quick non-descript meal at a restaurant on the outskirts of the “trulli” district before meandering through the town.There are many theories behind the origin of these interesting homes. One of the more popular theories is that due to high taxation on property the people of Puglia created dry wall constructions so that they could be dismantled when inspectors were in the area. A couple of hours wandering through and stumbling across an industrious local family that opens their home for a small fee to tourists, we were able to glimpse a bit of local life and move on to our destination of Ostuni. The locals told us to sit on their marital bed for a photo shot. Our drive through the back roads towards Ostuni was very pleasant, olive groves, trulli homes scattered here and there, large expanses of flat farming land. We chose to stay inland rather than coastal this time choosing the Masseria Cervarolo located approximately 6 kms away from the town of Ostuni. 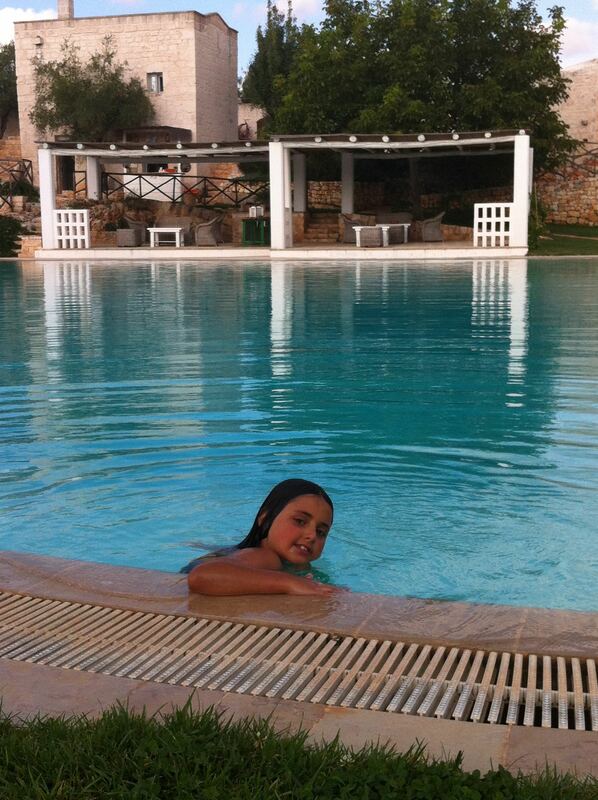 This was an A Puglia style countryside farm lodge. We based ourselves here as we had heard the food was magnificent. We were a few minutes drive from all the sights but a world away from everywhere. Looking back we were dissapointed we didn’t organise to stay here for a week. The setting was so relaxing and we only managed to touch the surface of this region. Food was a major part of why we stayed here and we spent the next two nights experience the delicacies of this area. Primarliy Puglian cuisine is based on good honest home grown food, the staff created delicious 6 course meals every evening from fresh produce in the area. We would leave the dining room a few kilos heavier each evening. We only had the chance to explore a handful of sights in the area. 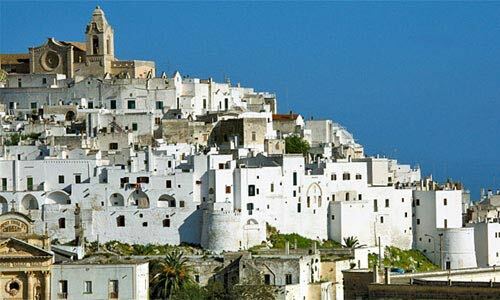 The white washed town of Ostuni was the top of our list. Perched high on top of a hill. The first sight of the town is breathtaking. 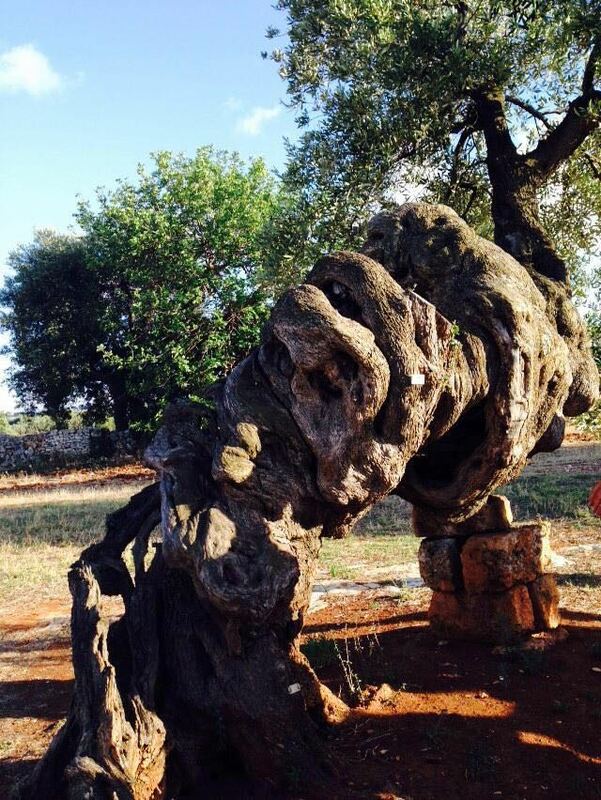 We also got the chance to explore the Grotte di Castellana, one of the most important attractions in Puglia. 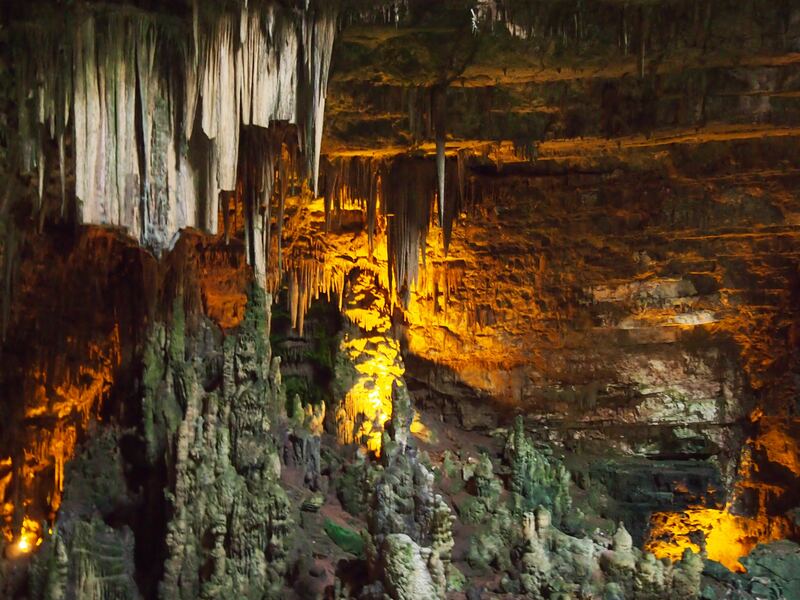 Located at the entrance of the Itria Valley, these limestone caves are Italy’s longest natural subterranean network. 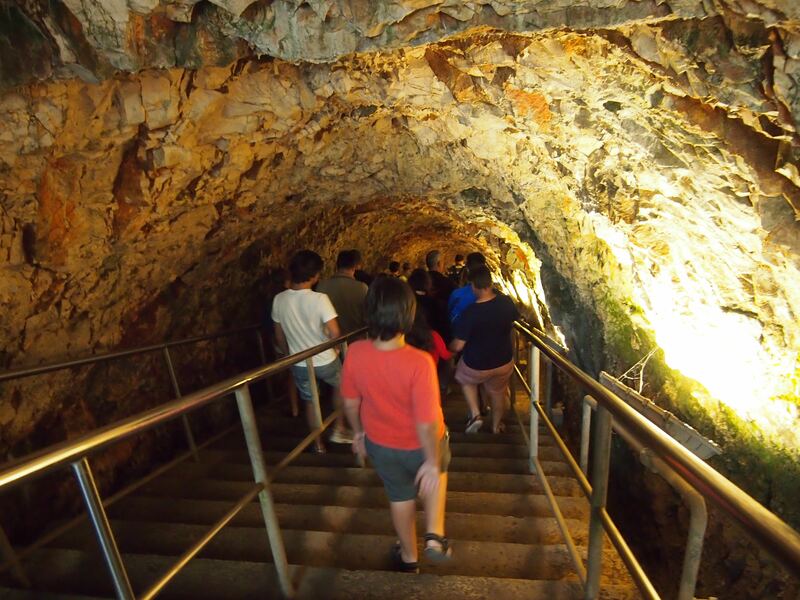 We took a guided tour venturing 60 metres deep into an opening that reveals a large cave full of stalactites, stalagmites and other incredible shapes. The tours ventures 3 kms into a winding path with amazing formations and colours. The tour lasted a good one and 1/2 hours, winding through a narrow path, every so often stopping to have the formations explained by the tour guide. In the dim light we walked single file, sometimes stumbling on a very slippery wet path, the unexpectedly we would emerge into a large cave. The kids were truly enthralled but also a little claustrophobic. I think we were all pleased to escape back into the blinding sun when it was over. Our last afternoon we drove just a few kilometres from our Masseria to visit the Masseria Brancati, they claim to have the oldest olive trees, more than 2000 years old. 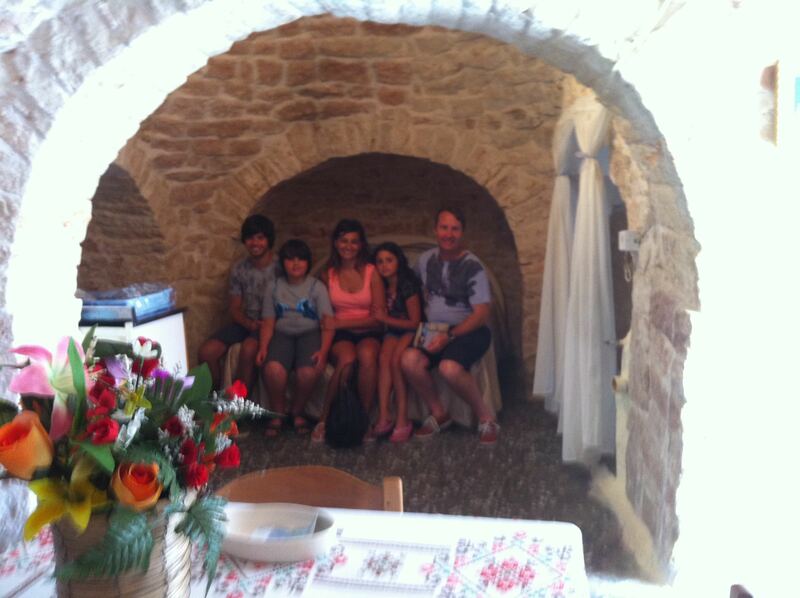 We where taken an a tour of the underground olive mill and enjoyed a very informative olive oil tasting. This region of Italy has so much to explore and still seems so untouched. 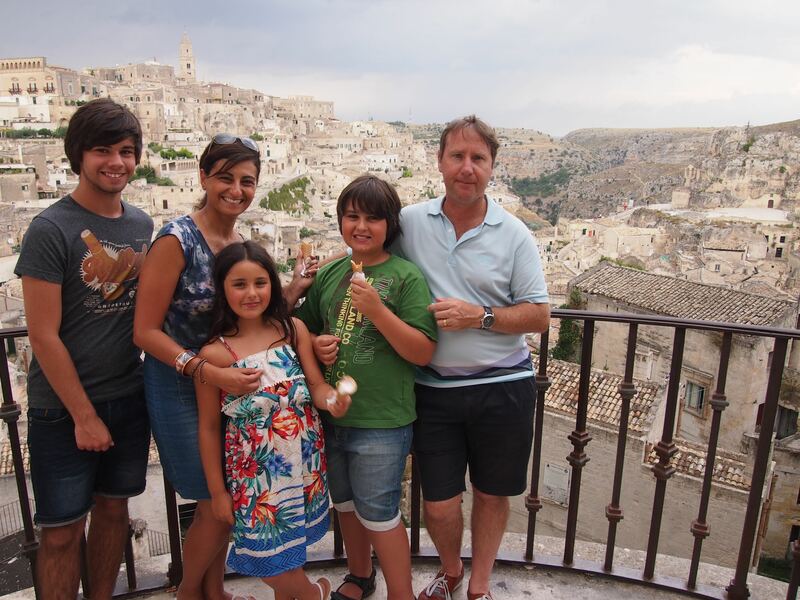 The tourists have starting flocking here in the last few years but apart from the hordes of tourists we experienced in Alberobello the other areas we explored there were only a handful of English speaking people we encountered. We plan a future more in depth visit to this amazing region.